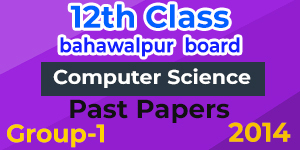 One of the youngest educational boards of Punjab, BISE Bahawalpur is the governmental body for conducting the examinations of Matriculation and Intermediate. Three major districts of Punjab inclucing Bahawalpur, Bahawalnagar and Rahim Yar Khan come under BISE Bahawalpur’s jurisdiction. The board conducts the exam of FSc, I.Com and F.A every year and the students pass their exam with distinction. The students of 12th class who are looking for the past papers of Intermediate 2nd year can download all the papers of BISE Bahawalpur here with utmost ease for a better preparation of the HSSC part 2 exam.